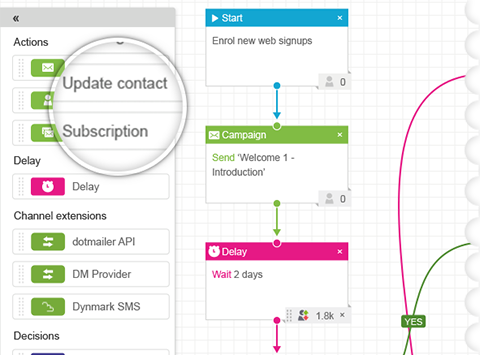 With their first quarterly release, dotmailer introduced new Multichannel Marketing features, extended their Automation as well as introduce a range of other updates. We highlight a few of the new features. 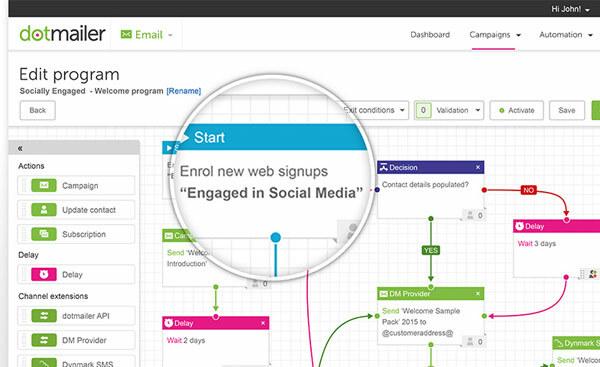 Marketers can now use other tools and services in programs via dotmailer’s new extensions. For instance a marketer can send SMSs (via Dynmark, Twilio or dotmailer itself) and create leads in a Salesforce account. It is also possible to write your own extension adding extra flexibility. New nodes within the program builder are introduced. A marketer can now create random splits, competition splits, address book subscriptions, program enrolments, make decisions based on dates and times, update contact data fields, and even add additional exit rules. Send time optimisation is now out of beta and available for all users. With Send time optimisation It takes the pain out of deciding when the best time to send is, because the platform optimises for you. STO also takes care of differences in time zones. For instance, if a marketer sends an email from the UK to the US, it would arrive at exactly the most frequent open time in that time zone. All surveys (old and new) now are now mobile responsive. If some or all of the respondents start a survey, but don’t complete it, then now a marketer is able to see the information that they did fill in. This means a marketer can re-engage with them, or even identify problem areas in surveys. Visitors can now be identified through forms and not only campaign links, and pages can now pass over custom tags for dotmailer to store, which can then be used for segmentation. A new addition is SocialInsight – which will look up socially-inspired information on contacts, and store it within the account. This allows to identify influencers or see what contacts are saying socially about your brand, then get in touch. A new update for the Magento and Salesforce connectors is available. For Magento there is new segmentation and loyalty points support for Magento Enterprise, external dynamic content styling, dynamic URLs, multiple subscription support, basket synchronisation for Insight data, and Feefo integration. For Salesforce, there is now the ability for users to view survey responses, WebInsight data and SocialInsight data inside the Salesforce CRM. Plus users are now able be able to view all the engagements made by contacts and add contacts to programs.